A radiosonde is a small weather station coupled with a radio transmitter. 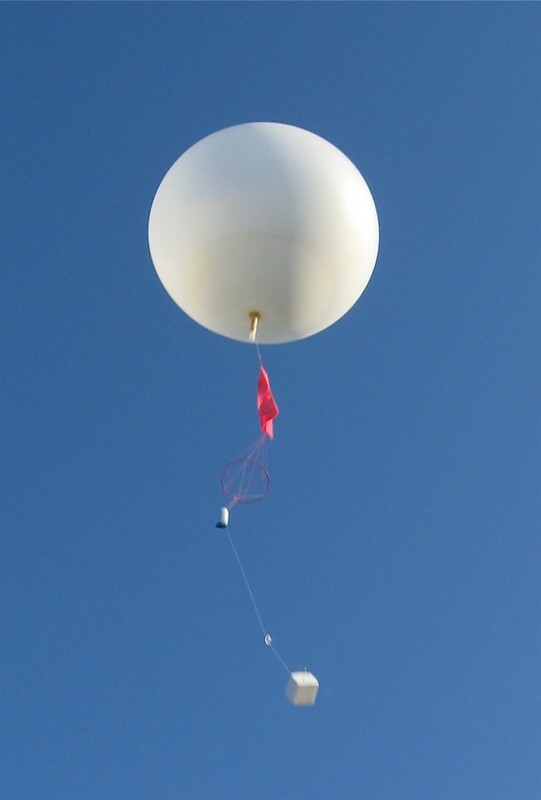 The radiosonde is attached to helium- or hydrogen-filled balloon, called variously a weather balloon or a sounding balloon, and the balloon lifts the radiosonde to altitudes exceeding 115,000 feet. During the radiosonde’s ascent, it transmits data on temperature, pressure, and humidity to a sea-, air-, or land-based receiving station. Often, the position of the radiosonde is tracked through GPS, radar, or other means, to provide data on the strength and direction of winds aloft. Thus the radiosonde flight produces a vertical profile of weather parameters in the area above which it was launched. At precisely the same time each day (1200 and 2400 UTC), weather personnel across the planet release radiosondes to the sky. Through international agreement, the 400-to-406 MHz and 1675-to-1700 MHz bands of the electromagnetic spectrum are reserved exclusively for these tiny airborne weather stations to radio their findings back to Earth. The data are processed, correlated with data from other radiosondes, and used to create an instantaneous picture of weather conditions throughout the world. The data are used not only to understand current weather patterns but also as inputs for longer-range computer-based forecasting models. The numbers of radiosondes launched are staggering. Dabberdt and Shellhorn et al report that in 1999, more than 440,000 soundings (the proper name for a radiosonde voyage) were made from 992 stations outside the US. The US National Weather Service releases about 75,000 radiosondes each year, not including the radiosonde flights made from military research-and-development facilities and for other specialized scientific purposes. In total, more than half a million radiosondes are launched around the world every year. Beginning in the late 1900s, air soundings (measurements of temperature, humidity, and air pressure) were taken with recording devices called meteorographs, which were attached to kites or tethered balloons. The meteorographs used soot-coated cylinders attached to clockwork mechanisms to record the scratchings of the rudimentary measurement devices. These were adequate for recording near-surface data, but for un-tethered, free-flying balloons were necessary to attain data from heights of 10, 20, and 30,000 feet and above. When the balloons burst from the pressure differentials at high altitudes, the payloads floated to earth on small parachutes. The chief problem with free balloons is that scientists had to rely on people finding the devices and then returning them, usually for a modest reward (see this drawing from a 1905 magazine article). Much of the pioneering work in the field of upper-air sounding with kites and balloons was done at the Blue Hill Observatory in Massachusetts, under the direction of A. Laurence Rotch. In the 1930s, recording meteorographs were affixed to the wings of vintage biplanes but flights of these “aerometeorographs” were often hampered by bad weather, and seldom attained heights greater than 10,000 feet. The next logical step in upper-air sounding was to add a radio transmitter to the meteorograph—thus a radio-meteorograph—so that data could be transmitted to a ground station in real time, and recovery of the device would not be necessary. This technique created a vertical profile of the temperature, humidity, and pressure above the launch site. The first recorded launch of such a device was by Robert Bureau in France, who gave the name “radiosonde” to his device. (The anniversary of that 7 January 1929 launch is celebrated as Radiosonde Day). The first practical radiosonde was developed by the Russian Pavel Molchanov (also spelled variously Moltchanov and Moltchanoff) in 1930. 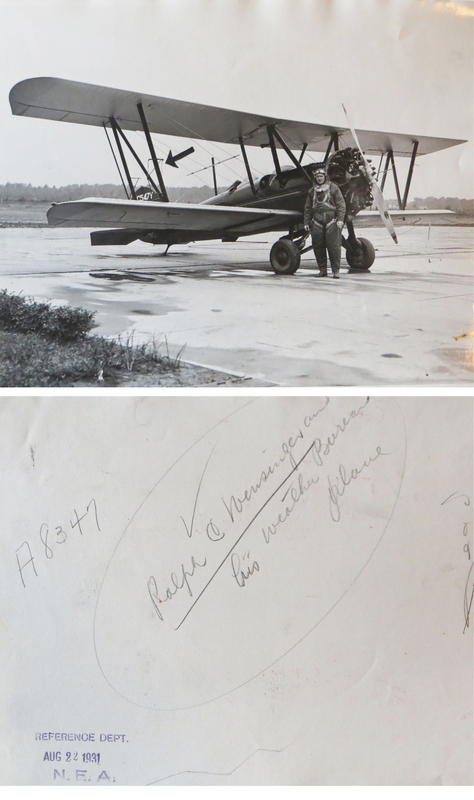 The following year, Professor Vilho Vaisala of Finland designed and flew a radiosonde, and in 1936 he established the Vaisala Company to manufacture the devices. Today, Vaisala, headquartered in Vantaa, Finland, is the largest producer of radiosondes in the world. Vaisala also visited the United States in 1936 and demonstrated his invention to Carl Rossby, the head of the Meteorology Department at the Massachusetts Institute of Technology (MIT). Meanwhile, researchers at the Blue Hill Observatory and the National Bureau of Standards were improving and refining radiosonde technology. On 23 December 1935, the first successful U.S. radiosonde flight was made from Blue Hill Observatory, the apparatus, designed by Dr. K. O. Lange, transmitting its signals to the ground station while reaching a height of 52,500 feet. It was clear that collecting data by balloon-borne radiosondes was cheaper and more reliable than the previous methods of gathering upper-air data. Radiosondes—sometimes referred to by the press as “robot reporters”—were soon being launched daily at U.S. Weather Bureau stations throughout the country. Over the years radiosondes have become more accurate, smaller, and cheaper. Specialized models have spun off. These include the dropsonde, which is launched from an aircraft, generally over a hurricane or other disturbance of interest, and transmits data as it descends under a parachute; and the ozonesonde, which measures the amount of ozone in the atmosphere. The basic principle of radiosonde operations—using a simple balloon to carry a small weather station into the sky and recording the signals that the device sends back—remains unchanged after more than 80 years. An excellent overview of the radiosonde and its history may be found in this document. Teachers: If you are a K-12 teacher planning a segment on meteorology, send me a note on your school letterhead or with a business card and I’ll send you a radiosonde and a package of background information.